As you will know by now Deborah Devonshire (one of the famous Mitford sisters), the Dowager Duchess of Devonshire is one of Paddy’s closest friends. Their communication by letters over more than half a century forms the basis for the collection of letters edited by Charlotte Mosley – ‘In Tearing Haste’ – of which I have written before. The seat of the Dukes of Devonshire is Chatsworth in Derbyshire and this year Chatsworth will be staging a special exhibition to celebrates Debo’s 90th birthday. I thought it worth posting details for those who may be interested. For more information please read the press release below or visit www.chatsworth.org . In an epic year, Chatsworth is staging a special exhibition throughout 2010 in honour of the 90th birthday of Deborah Devonshire (on March 31), now Dowager Duchess of Devonshire and the last surviving of the famous Mitford sisters. Feb 18, 2010 – Sister, mother, wife, Duchess, writer and celebrated national treasure. Over the years Deborah Devonshire’s path has taken her in many directions creating a life story which is nothing short of fascinating. In an epic year, Chatsworth is staging a special exhibition throughout 2010 in honour of the 90th birthday of Deborah (on March 31), now Dowager Duchess of Devonshire and the last surviving of the famous Mitford sisters, marking the nine eventful decades of her life, illustrating her many interests and achievements. Memories of the Dowager’s Mitford ancestry, and her famous siblings, will be evoked with many unique items never seen by visitors before, including numerous letters, plates from the much loved Berlin dinner service sold by her father and purchased by her husband, the Cavendish/Devonshire family tree and the beautiful Renoir painting left to Chatsworth by her sister Pamela. Visitors will experience a rare insight into the remarkable life of Deborah, illustrated with mementos and keepsakes personally chosen by her Grace including early diaries, the Dowager’s childhood ice skates (skating was an early passion), her nature notebook and a copy of her wedding invitation. Deborah’s passion for all things outdoors quickly becomes clear. A keen supporter and participant in all country pursuits, the exhibition will include the Duchess’s gun and game books. Two of her beautiful handmade walking sticks are also featured, and her love of poultry reflected in a wooden chicken sculpture and her rosettes and prizes for eggs. In the 1950s, the Dowager had the huge task of restoring Chatsworth after the depressing war years (it had been leased to a girls school), and making it fit for the growing number of visitors, and as a family home. The wallpaper patterns that she used then will be shown alongside the books she wrote later in life, celebrating Chatsworth’s house, collections, garden, food and landscape. Her growing family is represented by glamorous private images of her and her young children by Norman Parkinson. As Duchess, she was involved in many significant public and state events, and chose to take on many public responsibilities, charitable concerns and interests. The robes she wore to the Queen’s coronation in 1953, at which her son, the present Duke, was page to his grandmother Mary, widow of the 10th Duke, will be on display, alongside presentation objects from public engagements over the last 60 years. Having known many famous artists and writers, there will be displays of early work by Lucian Freud, sculpted heads of some of the Dowager’s more illustrious artistic friends, by Angela Conner, and the special edition of one of his books given to her by Evelyn Waugh, with blank pages to avoid the bother of actually having to read it. Her tastes and style are represented by a number of exquisite couture gowns and other clothes and hats; favourite works of art by Atkinson Grimshaw, Tchelitchev, Jo Self, Epstein, Frink and others; a selection of the jewelled insect brooches she was given by her husband over many decades; and mementos of her hero Elvis Presley, including the Elvis telephone, and a section of fence from Graceland. 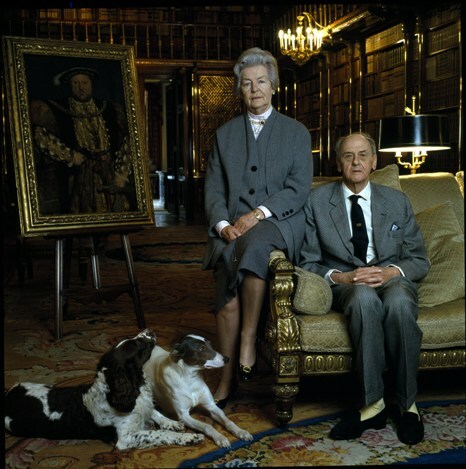 After 54 years in charge of Chatsworth [and its estate], Bolton Abbey and Lismore Castle in partnership with her husband, the late Duke, the Dowager’s retirement has not been quiet. Memorabilia relating to her latest books, and forthcoming memoirs, will be on display, together with new photographs taken for the exhibition, including a special image of the Dowager with her seventeen great grandchildren. This entry was posted in In Tearing Haste, Paddy's Friends and tagged Andrew Cavendish, Charlotte Mosley, Chatsworth, Deborah Devonshire on May 23, 2010 by proverbs6to10.